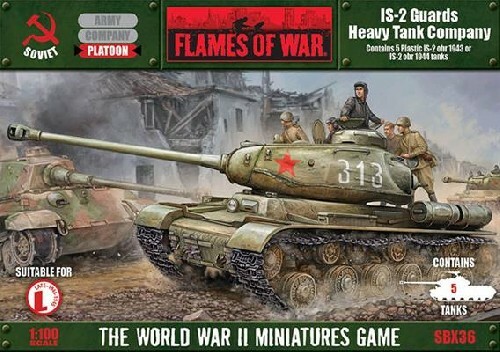 Includes five plastic IS-2 obr 1943 or IS-2 obr 1944 tanks, six tank commander figures and one decal sheet. When the IS-2 heavy tank entered service with the Guards Heavy Tank Companies of the Red Army, they were the most powerful tanks in the world. Better armoured than the German Tiger, they mounted a 122mm gun capable of destroying any tank in service or smashing an anti-tank gun nest in a single hit.